At the end of a very busy term, exam marking has begun, thanks to a very early exam this year. When the contract came through I was initially very pleased to see the bulk of my work would not take place in the holidays, forgetting how much I would need the break. Now I can't wait to get back to school next week! This is my 11th summer as an examiner, which must make it my 14th series, counting the January ones. Now I don't have much marking to do - only 45 scripts or so, due to my elevated position. This year I am managing 5 people who are managing 40 examiners, plus 2 examiners of my own. The entry is bigger this year so there is another person doing the same job as me. Last summer I had it to myself and I managed 9 people who were managing around 60 examiners. I had responsibility for the whole unit - 17,000 entries. I felt quite proud of myself. Teacher: It's nice now things have calmed down at work, isn't it? Teacher: You're marking for [insertexamboardname]? Teacher: Oh, I used to do that (dismissively) but it just wasn't worth my time, you know? At this point I usually nod and smile, and say something like, "It's only for three weeks a year." "I slightly resent the insinuation that your time is more valuable than mine, or that I am slightly simple for wanting to do this work"
"Doing this work for over a decade has given me a better understanding of the exam process than any amount of CPD ever could, even though I teach a different board - what comparable activity are you doing to improve outcomes for your students?" "I'm not actually marking: I hold quite a senior position which is giving me excellent experience of managing people whilst also demonstrating that I can multitask effectively in a couple of high pressured roles at a time. That goes on every application form I fill in"
"Thanks to my tenacity in this role, I have made a considerable sum of extra money this year from related side projects, thus proving it is definitely worth my time"
I usually think at least one of them, though. ...which sort of made up for it. We stayed in a little town called Bruck at the end of the Ziller Valley, and were able to ski four different sets of slopes through the week. We spent three days skiing in Penken (I think - the piste map for the whole area is so big I am struggling to remember) then moved to the Zillertal Arena for a day, on the day when it snowed so there was about a foot of fresh powder; I had to spend the first couple of hours with a poorly student so I skied through lunch and for the rest of the afternoon, and the area was so extensive that I barely saw any of the students. Result! This was my favourite place: loads of wide reds. On Thursday we went to Hintertux to give the students some experience of skiing on the glacier, at the request of our partner school. It wasn't a great day for many of the beginners, who found the long periods of standing around in the freezing winds exhausting (there's a lot of standing around when you're in a beginner group) and the nursery slope a bit steep. It was very chilly indeed, and snowed most of the day. After lunch I skied with Yakob and Tom, my colleagues, for a while. Tom decided we should take the long chair to Mordor, as he put it. He had been on it in the morning and realised he was the only person, as he huddled into a corner to try and keep out of the wind. When he got to the top it was a white out and he had no piste map or idea of how to get down. Luckily he was feeling more confident the second time, though he neglected to tell me that there was a long T-bar lift at the top. Utter git. My hatred for T-bars is legendary, and only deepened by Yakob pushing me over when we got to the top (he would strongly deny he had anything to do with it but I am certain I couldn't have just fallen over). 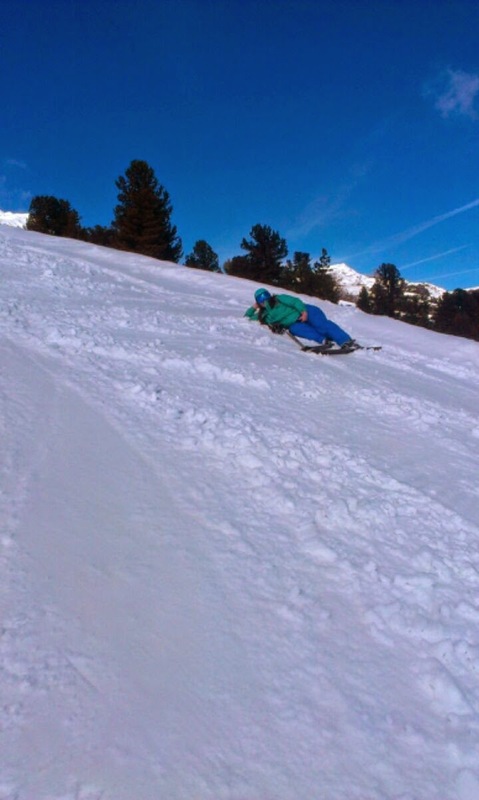 It was worth it though: acres of unskied powder and some lovely slopes back. It took me a while, though, and the bus was waiting, loaded with everybody's boots and skis, by the time I made it down from the top. I bought a new helmet, after I attempted to remove the padding in mine to dry it out and it ripped into two strips as I pulled it. It was 7 trips old so probably needed replacing, anyway. I bought new goggles to match and I now have a lovely ski outfit of blues and greens and not a hint of black in sight. I also decided that my trusty old boots had had their day. They were also 7 trips old, and they weren't particularly expensive so they have done their duty. They saw me through 4 school trips and the very difficult ASCL week in Stubai, where they picked up some eyes so they could see where they were going. 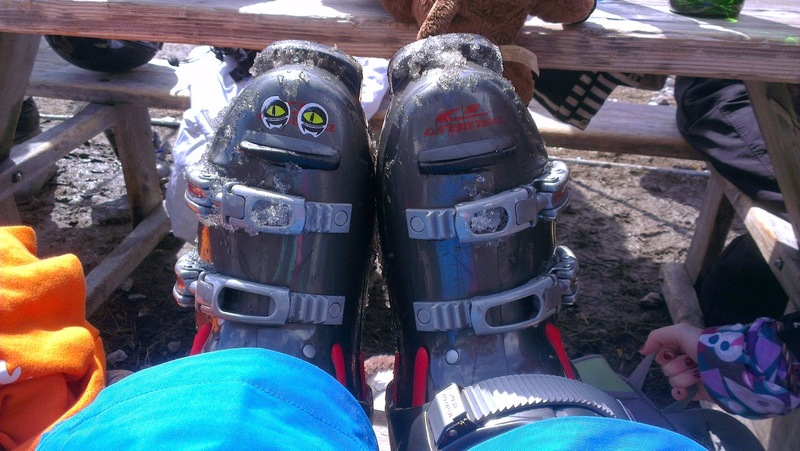 Tom gave me Mother Tom's boots last year after she injured her knee and had to give up skiing. They are much nicer but will need wearing in and I kept going back to my old faithfuls, even though they were sort of not waterproof anymore. I thought about bringing them home and keeping them as reserve boots but realised I would probably just keep wearing them if I did that, so I took Tom's advice and left them on the last bubble we took down on the last day. Released into the wild. Imagine the adventures they're having! Other good things about the Ziller Valley? Mayrhofen was having a street party on the night we went shopping there, called the Leder Hoedown (hur hur), which looked like it would have been really fun. We went to an amazing swimming pool one night, which had some very fun slides, a wave pool, a rapids section, an outdoor pool and a salt pool (this last was easily my favourite). The hotel, the Eberleiten, was extremely comfortable and served very good food. All good, really. For our beginner skiers it might have been better to stick with just one set of slopes, but it was great to have the option. 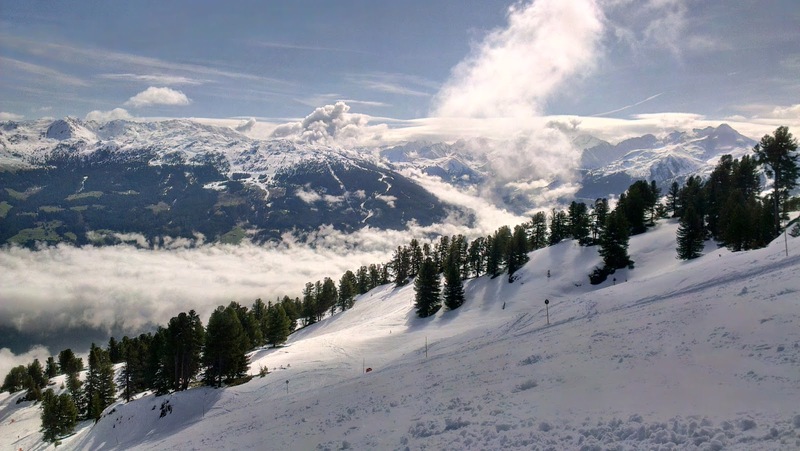 I'd definitely recommend it for people who like variety on their ski holidays. I have been working hard on two things this weekend. First - black lace. The border is not too difficult on this one. It's 12 rows, or 6 double joins, which, by my maths, means 60 repeats on each side plus the corners and ends. Ends are probably another 6 each. No idea about corners. I've done 8 repeats, so all I really know for sure is, I've got a way to go yet. Luckily, like I said, it's not difficult - just sometimes hard to see. A handy hint I can share with you after taking these pictures - when lifting your lace scarf into position for its close up, be certain that the needle attached to the live stitches hasn't stuck itself into the ground. This is important because if it has, and you don't notice, you'll put that needle right out and have to try and find the 7 black lace stitches again. I've been wanted to knit this top for at least a year, in spite of being relatively certain it will not suit my body shape. It involves knitting a parallelogram of stripes, grafting the provisional cast on with the live stitches, then picking up for ribbing around the top and bottom and adding knitted straps with a cute button. I will be adding ribbon straps because this ribbon inspired me to knit the top in the first place. I found a lovely button at Wonderwool. So, for somebody with such a pronounced pear shape, can we imagine how this will fit me? Badly, I am imagining. I thought about doing some short rows for a flared bottom, but I have thus far been unsuccessful in thinking of the how for this scenario. Instead, which I am thinking is that I will knit the parallelogram wide enough to go round my hips which may or may not be a full 8 inches too big for my underarm measurement (I haven't actually measured) and then perform chicanery with the ribbing. Tight ribbing on a smaller needle with a few k2togs on the first row I pick up around the top. No ribbing on the bottom - maybe an applied icord instead. We'll see. I'm unsure about going down another needle size - it's already fairly bullet proof, being knitted on 3.25mm needles instead of the 4mm recommended for Smoothie. It isn't fun to knit at this tension. All I want to do is get the Chiaogoos out and cast on the blue linen I bought last weekend. But, I've bought so much Smoothie and never yet finished anything I've knitted from it, so I really must persevere.